In fall 2014, Dermot Ryan—an associate professor in the Department of English at Loyola Marymount University—and Melanie Hubbard—the university’s digital scholarship librarian—designed and taught The Digital Eighteenth Century, a class which culminated in the creation of a digital space that showcases the digital projects students completed over the course of the semester. You can find a video introduction to our class and the various student digital projects at [email protected]. Our concept for the class was simple: students would better grasp the literature and culture of the eighteenth century by drawing connections between the eighteenth-century print revolution and aspects of the current digital communications revolution. 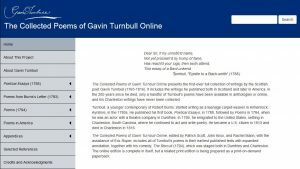 The incorporation of digital tools and assignments was intended to illustrate and provide hands-on experience with this technological shift as well as give students a new way into the study and presentation of eighteenth-century cultural materials. The assignments were fairly basic. Students used the Eighteenth Century Collections Online (ECCO) database not simply to locate specific texts but rather to answer basic research questions. How many titles containing the adjective “lyrical” appear before the 1798 publication of Lyrical Ballads? Can we trace any other literature on children chimney sweepers before William Blake’s poem on the subject? Can we locate sources for the figure of the hermit in Charlotte Smith’s poem Beachy Head? Students used TimeMapper to track the development of eighteenth-century literary or cultural events across space as well as time (see example). 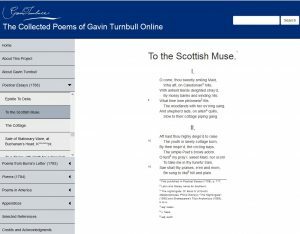 Poetry Genius, an online annotation tool, was used to become more familiar with eighteenth-century poetry (see example). Students brought eighteenth-century visual and literary culture together by creating digital essays in Tumblr (see example). Because their work would be public, students were required to keep their audience in mind and ask themselves the following types of questions: What helps me understand the literature and cultural artifacts that we are studying in this class? How do I present these materials in a manner that a broader audience would find accessible and compelling? The students’ projects are now part of [email protected], a site that Melanie created to be a hub for LMU’s current and future DH projects. 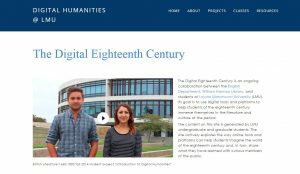 In a sense, The Digital Eighteenth Century was our practical response to a series of interrelated challenges that many of our colleagues face: How do you foster digital humanities at a university that is largely focused on undergraduate education and has many of the trademarks of a liberal arts college? How do you get from zero with little or no resources and a minimum of institutional support? How do you do that when you yourself have had little or no institutional exposure to professional training in the tools, practices, and methods of DH? Research in the humanities tends to be non-collaborative. UR in the humanities has traditionally involved student-led initiatives with students working on topics related only tangentially to a faculty member’s own research. Research in the humanities cannot be easily “segmented” into manageable units for undergraduate researchers. There is a high threshold to entry into humanities research. There is no incentive: in universities that do not have large Ph.D. or postdoctoral programs, the sciences “need” undergraduates to conduct research; conversely, UR potentially distracts humanist scholars from their research. DH can challenge the canard that research in the humanities is inherently non-collaborative. Research projects in DH can be parsed into manageable units. DH can allow us to generate online research projects that allow for ongoing student/faculty collaboration while contributing to faculty scholarship, rather than diverting attention from faculty research. The eighteenth century is a particularly rich time period for these kinds of faculty and student collaborations not only because eighteenth-century print culture with its focus on social networking and media storms bears some striking resemblances to our particular moment but also because there are a number of rich online eighteenth-century resources, like ECCO, on which our students can draw. 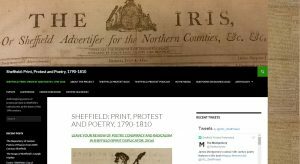 Sheffield: Print, Protest and Poetry, 1790-1810 is an ever-growing digital anthology of protest poetry printed in Sheffield’s radical press at the end of the eighteenth century. Directed by Dr. Hamish Mathison and researched by Dr. Adam James Smith, the anthology was born of an AHRC-funded cultural engagement project focusing on the full collections of The Sheffield Register (1787-1794) and The Sheffield Iris (1794-1825), newspapers held in University Library Special Collections. The Register was edited by Joseph Gales, the Iris by Sheffield’s legendary poet and prolific champion of cause, James Montgomery. Writing under the close scrutiny of suspicious local authorities both the Register and the Iris presented their most controversial material in a section referred to affectionately by readers as “Poetry Corner.” This section saw the publication of a different poem each week (either written by a Sheffield resident or aggregated from elsewhere) but usually addressed to one of a series of recurrent themes: religious integration, racial equality, worker’s rights, universal access to education, and political enfranchisement for all. But to speak all we think, will not suit in our day. These lines proved prophetic, with the Register coming to an abrupt close a few months later. Charged with “conspiracy against the government,” Gales was forced to abandon the paper to start a new life in America as a fugitive. The Sheffield: Print, Protest Poetry, 1790-1810 project has been releasing a different poem every week, and online readers have been surprised and excited by how prescient they have proved. One poem titled “On the Effects of Gold” warned that political reform was never likely whilst politicians were more interested in lining their own pockets. 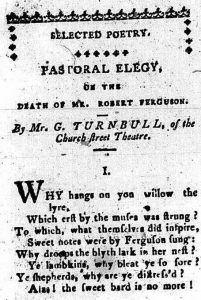 This poem was made live on the Sheffield: Print, Protest Poetry, 1790-1810 website the day before the Panama Papers story broke. 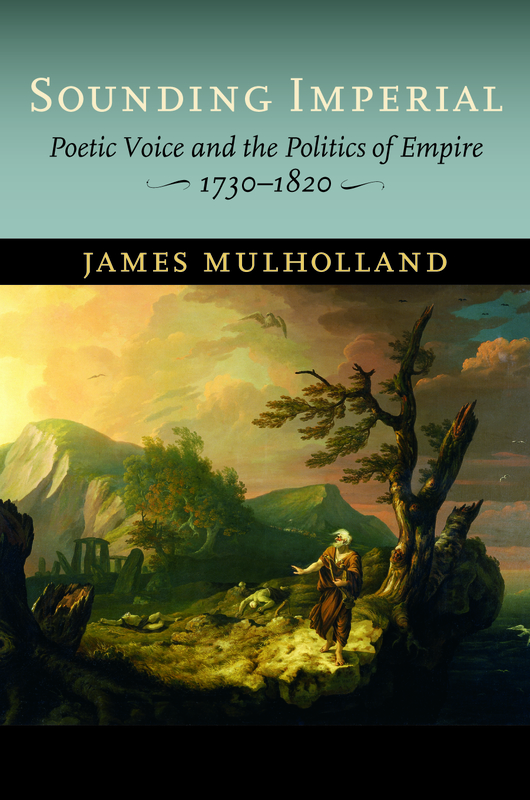 The first installment of the anthology focuses on poems printed between 1794 and 1796, marking the transition from the Register to the Iris. This transition was brought about when the editor of the Register was charged with conspiracy against the government and forced to flee to America. There will also be a printed anthology titled Poetry, Conspiracy, Radical in Sheffield (Spirit Duplicator, 2016), and new recordings of some of these poems have already been released on Soundcloud. We also have a Podcast, which seeks to situate these poems in broader national contexts. You can follow Sheffield: Print, Protest and Poetry, 1790-1810 on Facebook and Twitter. Faculty and students at the University of Pittsburgh at Greensburg are working on a long-range digital project (Digital Archives and Pacific Cultures) to code and analyze the voyage narratives of eighteenth-century European expeditions to the Pacific, together with the English poetry and print media that responded to the published accounts of Pacific voyages. We are attempting to study the cross-cultural significance of European voyages in the Pacific and cultural contact experiences in Oceania and Australia, using digital coding and “text-mining” to collect information from very long voyage records in systematic ways through computational methods. One phase of our work involves preparing digital editions of Pacific voyage publications by Hawkesworth, Cook, and the Forsters in TEI XML (the language of the Text Encoding Initiative) to meet a world standard for accessible and consistently encoded digital texts. (For more on the Text Encoding Initiative, please see http://www.tei-c.org/index.xml). Some of the voyage accounts we have prepared for the site have not been freely available online in any searchable form before. Some are available in proprietary or public databases but have not, to this point, been united in one place. In addition to preparing editions, we have collected the geographic coordinates recorded in these publications using regular expression matching and autotagging, in order to generate Google Earth & Map views of the voyages. Our Google Earth projections of Wallis’s and Cook’s voyages offer a clickable interface, so that selecting a compass rose point along the voyage brings up a paragraph or block of text from a voyage record describing events recorded in connection with this place. Here is an example. We have also been preparing TEI XML editions of poems, plays, and excerpts from literary and philosophical texts that respond in some way to the Pacific voyage publications. These texts were located by searching the ECCO and ECCO TCP databases, and we will be adding more material from these resources and the Burney Collection. Our students have been preparing and marking these files to code specific kinds of cultural interactions so that we can study how English texts represented Pacific encounters and identify the types of interactions which seem to have caught the interest of Atlantic-bound media. We’ve also provided an interactive clickable interface to “color-code” the poems, highlighting names of people and places as well as the cultural markup our students have applied: See our edition of Anna Seward’s “Elegy on Captain Cook” (1780). Please see also our edition of Gerald Fitzgerald’s “The Injured Islanders” (1779), produced just before the news of Cook’s death became known in England. We offer Fitzgerald’s poem as a significant contrast to the cultural representations in Seward’s work. The project began and is developing at the University of Pittsburgh’s Greensburg campus, but the site’s initial development joined a team of faculty and undergraduate students at the Pittsburgh and Greensburg campuses. As the project continues to develop, it combines classroom teaching of digital humanities research methods together with new research to build a publicly accessible resource. Our texts and markup and our data visualization experiments are very much a work in progress and are freely available to the public for reading or to download as the basis of new digital projects under a Creative Commons license. Our site will continue to expand over the next few years as we experiment with topic modelling the Pacific voyage texts and as we develop new maps, search tools, and network graphics, working with new groups of students. 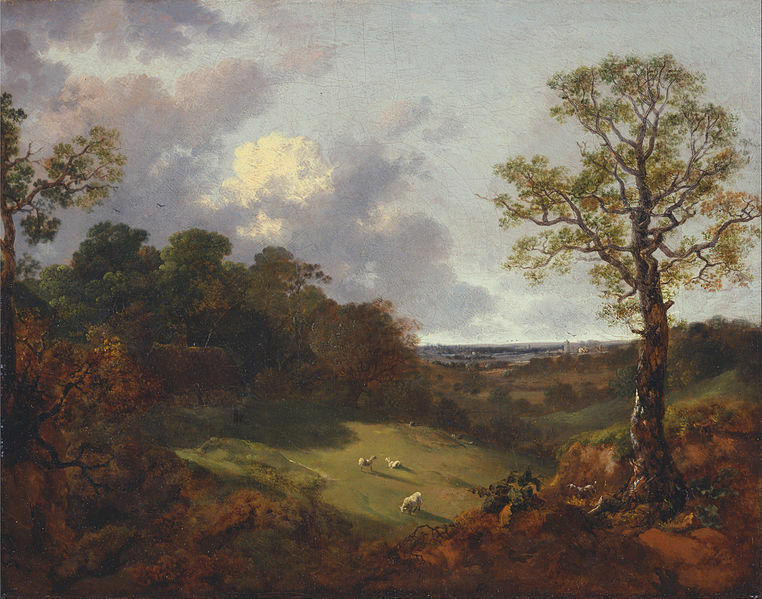 In September 1792, on the day of the autumnal equinox, a Welshman named Iolo Morganwg met friends on Primrose Hill near what is now Regent’s Park in London. There, they made a circle out of stones. The largest stone was fashioned into an altar. On this altar was placed an unsheathed sword. Standing on these stones and dressed in wildly colored robes, the company recited Welsh history and poetry. They were pretending to be ancient Welsh bards. gorsedd) from Britanny in 1906. This Breton meeting provides a modern example of earlier Welsh models of the festival. The meeting might sound like a pagan ritual or a group of overzealous Lord of the Rings enthusiasts, but this performance was serious business. The goal was to revive the customs of an almost forgotten Wales. 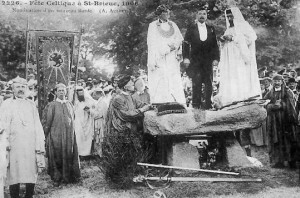 Morganwg, the organizer, called these performances gorsedd, which he translated as “voice convention.” He imagined these meetings as communal poetic voices reasserting a unique Welsh culture, different from that of England or Scotland. Morganwg kept these performances going for decades, and elements of these early meetings made their way into the Welsh National Eisteddfod, an annual poetry and folk singing festival that still goes on today. 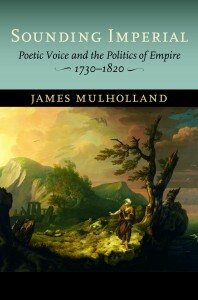 I came across Morganwg and his merry band of guerilla poets while researching Sounding Imperial: Poetic Voice and the Politics of Empire, 1730-1820. I wanted to offer an unorthodox history of English poetry that looks at the other side of the eighteenth century’s reputation for polite, dainty verse. Instead, I sought out the century’s wild and bellicose figures, the majority of whom are now forgotten. We haven’t paid much attention to these rowdy vocal experiments because we’ve forgotten what poetry used to be like. In the twenty-first century, we have two attitudes toward poetry, both of which come to us from the 1800s. Those who adhere to the first attitude perceive poetry to be moody and introspective, written and read by people in touch with their emotions. For them, poetry is revelatory; it’s something that changes your life. Think William Wordsworth and Dead Poets Society. But poetry wasn’t always this way. Sounding Imperial captures what it was like in the decades before these modern attitudes toward poetry took shape. The 1700s were a time when no one cared about how poets felt. Poetry was supposed to be about politics, nation, empire, and history, not something as small and mundane as personal feelings. That’s why my book moves from England to Wales to Scotland and India, seeking out authors who were culture warriors, nationalists, radicals and revolutionaries, and avid colonialists as well. Their enthusiasm was electric, and their sense of poetry’s possibility was enormous. For these eighteenth-century artists, composing poems meant communing with the dead, making ancient bards speak again, and preserving cultures that were going extinct. It required gathering in the early morning light to stand on stones and recite poems in Welsh. No moody introspection for these performers and no self-serving, brooding rebellion. Instead, for them, poetry makes the nation sing, fulfilling a mission driven by the grand arc of history.